Chaudhary, S.; Teodorescu, R.; Rodriguez, P.
Several large offshore wind power plants (WPP) are planned in the seas around Europe. VSC-HVDC is a suitable means of integrating such large and distant offshore WPP which need long submarine cable transmission to the onshore grid. Recent trend is to use large wind turbine generators with full scale converters to achieve an optimal operation over a wide speed range. The offshore grid then becomes very much different from the conventional power system grid, in the sense that it is connected to power electronic converters only. A model of the wind power plant with VSC-HVDC connection is developed in PSCAD for time-domain dynamic simulation. This paper presents the modelling and simulation of such a system. A single line to ground fault has been simulated and fault currents for the grounded and ungrounded offshore grid system is obtained through simulation and then compared. Chaudhary, S. [et al.]. 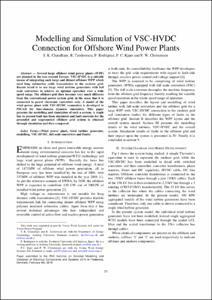 Modelling and simulation of VSC-HVDC connection for offshore wind power plants. A: Energynet.dk. "Proceedings of the Danish Phd Seminar on Detailed Modeling and Validation of Electrical Components and Systems 2010". 2010, p. 53-57.